How to customize the Foreground color for cells in a column based on the cell content? SfDataGrid displays all the text values in GridCells with a default Foreground color of RGB values 51. However SfDataGrid allows you to customize the Foreground color of the GridCells for the entire view and also to some specific cells based on conditions. To change the Foreground color of the GridCells for the entire view, you can use the SfDataGrid.GridStyle property and set the custom style to change the foreground color. For more details please refer our user documentation in the below link. In case, if your requirement is to change the foreground color based on the cell value, then you can achieve this by using the CellStyle property in the GridColumn. You can write converters for the style properties based on your requirements. 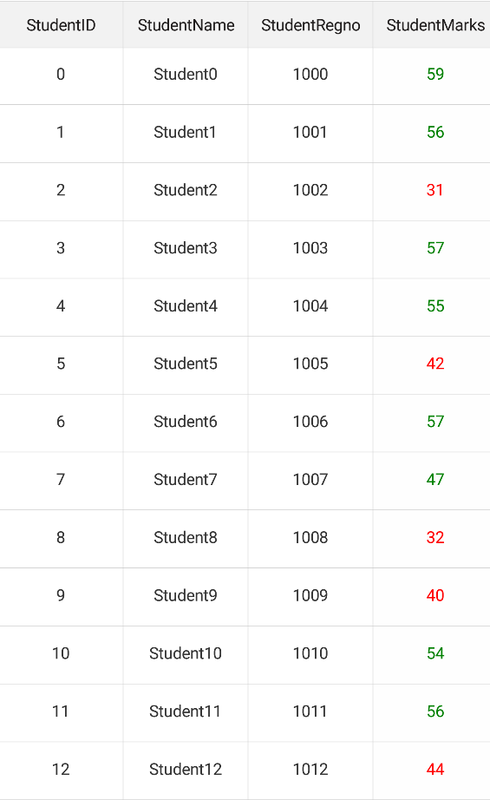 Refer the below code example in which foreground color of the StudentsMarks column is customized based on conditions written in the converter. Refer the below code example for writing a converter to customize the cell foreground based on conditions. For more details about applying conditional styles for a column in SfDataGrid, please refer the below user documentation link. You can download the working sample for this KB from the below link. gose to page not found.